Groupon is a fascinating study in the fusion of online and offline marketing tactics to drive local business. Couponing sites have come and gone over the years, but Groupon’s connection to social media is turning it into a bit of a movement. A typical Groupon offer. Click to enlarge the image. 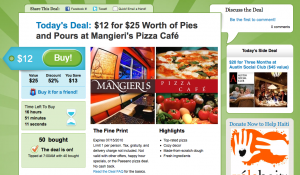 Groupon allows businesses to find new customers online, but then drives them to that local place of business offline. Once they show us, they are already a customer and the business have yet to spend a dime to get them there. Hum, pretty cool. Groupon groupies are nuts about this tool and you should just sign up for the Groupons, but small businesses of all kinds should take a look at this lead and customer generation tool. I’ve used Groupons on several occasions and in all cases it led to me a business I had never done business with before. Get creative and take a good, hard look at Groupon.